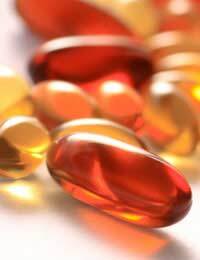 Omega 3 Fish Oils and ADHD - Can they Help? Home > Alternative Therapies > Omega 3 Fish Oils and ADHD - Can they Help? When you consider that Omega 3 Essential Fatty Acids (EFAs) make up a very large proportion of the human brain and its neural tissues, it should come as no surprise that this nutrient is extremely important for the brain's normal function and operation. Omega 3 EFAs are essential nutrients's that the human body cannot make. Just like vitamins and minerals, they must be eaten in the diet. What is more, Omega 3 has three different chemical forms that are referred to as DHA and EPA which are found in fish and seafood, as well as ALA which is found in whole grains and seeds such as flaxseed and linseed oils, and olive oils. Several studies have noted that people who suffer from ADHD or Attention Deficit Hyperactivity Disorder seem to have lower blood levels of DHA and EPA than normal people. ADHD - Problems with Omega 3 Metabolism? Whilst the human body cannot make any of the three forms of Omega 3, most people can change one form of Omega 3 fairly easily into another. However, in some people this conversion mechanism does not work properly and no-one knows if this could be a problem in ADHD or ADD. At least one study has shown that children and adults with ADHD develop significantly lower blood levels of Omega 3 compared with normal people. This is true even when very similar diets are followed by the control (non ADHD sufferers) and ADHD group. This study suggests that there may be differences in the way ADHD sufferers absorb and/or convert the Omega 3 eaten in their diets. For every single molecule of Omega 3 we should have about 2 to 3 molecules of Omega 6 in our blood. In ADHD there is more usually a ratio of one Omega 3 molecule to twenty Omega 6 molecules. It is not so much that there is too much Omega 6 in the diet, simply that there does not appear to be enough Omega 3 in its EPA and DHA forms. It is the balance and ratio of these two nutrients that is important in health. Many studies have observed that when the ratio or balance between Omega 3 and Omega 6 gets too high, it is strongly linked with both ADHD symptoms and depression. The higher the ratio, the more severe the symptoms of depression or ADHD. To investigate this association further, many small studies have looked at giving ADHD sufferers Omega 3 supplements containing EFA and DHA to help correct this imbalance and bring the ratio back to normal levels. The results have been promising. However, larger studies are needed to confirm these results before the medical establishment will accept that managing Omega 3 levels is very important in controlling ADHD symptoms. Researchers in Italy, the United States and Australia have found that they were able to highly significantly reduce the ADHD symptoms of inattention, hyperactivity and impulsiveness by giving fish oil supplements that included both EPA and DHA. The Australian study directly compared the effects of fish oil supplementation and Ritalin or methylphenidate, which is the most common form of drug therapy for ADHD. While the study only involved 103 children, they found that giving Omega 3 over a period of 30 weeks improved ADHD symptoms as much as giving Ritalin for four weeks or more. What was important for the scientific establishment was that this study was randomised and placebo controlled. In the UK, researchers at Oxford also conducted a randomised and placebo controlled trial to look at the effects of supplementing school children with a mixture of essential fatty acids, including EPA and DHA. They found that reading age and spelling ability improved significantly in the children who received the real supplement. Improvements in reading age over the first three months of the study was 9.5 months in the EFA group compared with 3.3 months in children who received placebo. Similarly, the spelling age of the supplement group increased by 6.6 months compared with only 1.2 months in the placebo group over the same three month period. Most importantly, this rate of improvement was continued for the next six months of the trial. These results are remarkable. Much larger studies need to be funded by health authorities and governments around the world to investigate the benefits seen in these studies. In the meantime, fish rich diets and/or supplementation with EFA and DHA could help to produce marked improvements in ADHD symptoms in both children and adults.